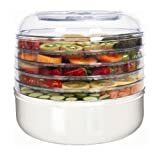 Save money and time by creating your own healthy or low carb snacks quickly and easily at home with the Ronco FD1005WHGEN 5-tray food dehydrator. It's a snap to whip up a batch of beef or turkey jerky, banana, pineapple or apple snacks, dried vegetables or herbs, homemade yogurt - or so much more. The included instructional booklet tells you how. A 10-year warranty backs it all up.